Click on the banner to see the full tour schedule! Source: Review copy provided by the publisher in exchange for a fair and honest review. I've loved Deb Caletti's books for a while now--since before I started blogging for sure. So now I eagerly await her releases so I can read them and talk about them and love them. And A Heart in a Body in the World is definitely one to love. I'm hesitant to say too much specifically because going into this one with nothing more than the blurb has a serious effect. The story builds and sneaks up on you and punches you in the feels in the very best way. - The characters. Annabelle, whom I am in awe of and also feel for. Her family. Her friends. - The story. Poignant and timely and so very striking. - The writing. Deb Caletti crafted this novel beautifully. The entire book has an atmosphere abut it that builds and builds and them BAM I was crying and I loved this book and wow. - How this book made me feel. Obviously this point is subjective. But while this book was making my eyes sweat, it was also twisting my heart in ways that weren't entirely hurtful. You know, thanks to the beauty of this story. 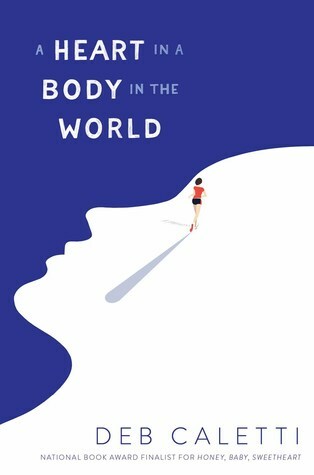 Overall, A Heart in a Body in the World is a striking, poignant novel that is not to be missed. I loved this one by Deb Caletti and I absolutely cannot wait to see what she has coming next. 4.5 stars - A beautifully written, striking novel that is not to be missed. I love suspense filled books, they keep me interested. I am so looking forward to this read! I am so looking forward to this read. It sounds so good! Thanks for sharing! This is a new author for me! This sounds really good! I also haven't read any of Deb's books, will definitely fix that soon!